Pizza margherita (left), margherita pizza with the fresh tomato sauce, mozzarella and basil; bianca salsiccia e funghi (right), pizza with sausage and mushroom; and pizza con le patate, pizza with potatoes, truffle oil, fontina; can be seen recently at Massimo's Pizza Bar in Bangor. Massimo Ranni (right) and his wife, Anne Marie Ranni, quickly set the table before sampling some of the pizzas and other food they will offer at their new establishment, Massimo's Pizza Bar, in Bangor. Massimo Ranni shows off bruschetta, garlicky bread with tomato, on March 23 at Massimo's Pizza Bar in Bangor. 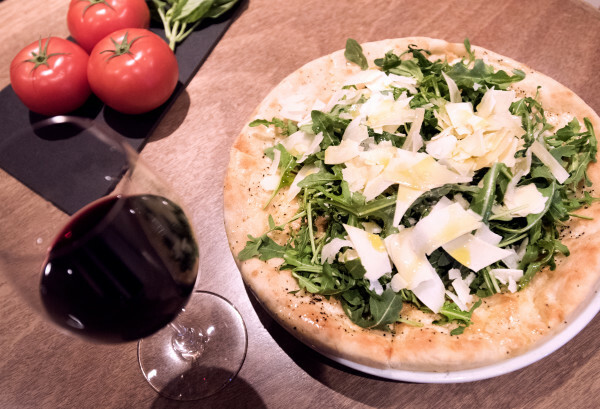 Pizza con rucola parmigiano reggiano, pizza with arugula and parmesan, can be seen recently at Massimo's Pizza Bar in Bangor. The new Massimo's Pizza Bar in Bangor. BANGOR, Maine — On a recent afternoon, Massimo Ranni emerged from the kitchen of 130 Hammond St., practically gliding through the space while balancing a plate holding a traditional Roman thin crust pizza on his fingertips. He placed it carefully on the table, part of a preview tasting of the traditional Roman fare available at his newest culinary venture. Massimo’s Pizza Bar opened quietly this week on Monday, April 11, with the owners of Massimo’s Breads and the now-closed Massimo’s Cucina Italiana at its helm. At the recent tasting, the aromas of thinly sliced potato, fontina cheese and truffle oil wafted from the freshly fired crust. The pizza is entirely different from the family-sized pies slathered in sauce and delivered to local doorsteps by other pizza places. It is individually-sized, simple and sparely topped, the crust a thin, crispy layer that stands up to the heft of the pieces. “In America, generally speaking, pizza is what you eat when you want to eat inexpensively and stuff yourself. You eat one of these, which we consider an individual pizza — you eat one of these, and you’re still so light, you’re not stuffed, you don’t feel heavy. So it’s good news, bad news. It’s bad news for people who want to eat cheaply and be stuffed. It’s good news for the rest of us,” Anne Marie Ranni said. 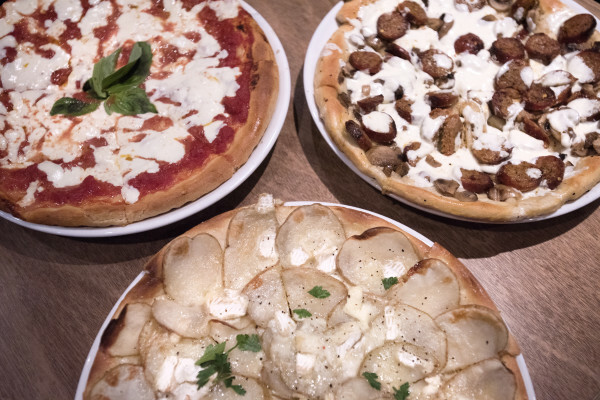 For those who still long for the signature pasta dishes from Massimo’s Cucina Italiana, they’re in for a treat: Massimo’s Pizza Bar will offer a selection in addition to the new menu items. The Rannis considered their regulars, who voiced how much they’d miss the former restaurant’s fare, and decided to combine the old menu with the new. As they got situated in their new space, they realized they had the room in the kitchen to offer both pizza and some staples from before. The Massimo’s Pizza Bar menu features a spread of artisan pizzas, beer and wine and various menu items. Highlights include the pizza margherita, a combination of fresh tomato sauce, mozzarella and basil on a crisp, thin crust, and pasta dishes such as linguine alla carbonara, fettucine con gamberi and linguine aglio e oilo. “I always say you can never get too many carbs,” Anne Marie Ranni joked as Massimo Ranni brought out pizza after pizza. In Italy, pizza is a light dinner option, the Rannis said. Other new offerings include pizza con le patate​, a pizza topped with thinly sliced potatoes, fontina cheese and truffle oil; bianca salsiccia e funghi, a pizza with sausage and mushroom​; pizza con rucola parmigiano reggiano, a combination of arugula and fresh parmesan on a soft, foldable crust; and pizza alla puttanesca, a medley of kalamata olives, capers and anchovies. 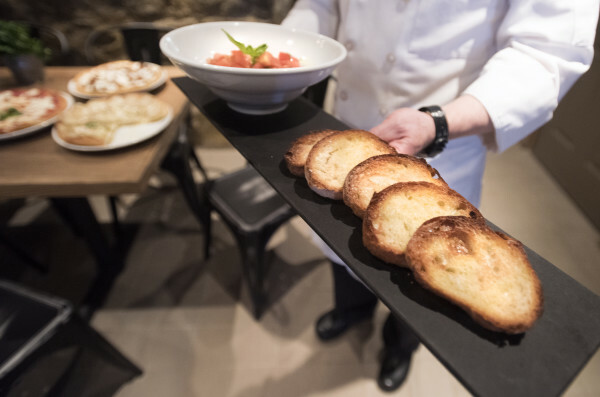 Ranni also has added bruschetta to the menu, a crisp bread​ flavored with a rub of garlic and served with fresh tomatoes and basil. The eatery also will offer gluten free pizza and pasta options. For the chocolate lovers, there is pizza bianca con nutella — a sweet dessert pizza topped with a European favorite, nutella, and a dash of powdered sugar. Ranni didn’t want to give it all away, so there are more pizzas to be discovered along with specials that will bring new pies into the mix. “With Italian food, it’s always a balance. It’s a balance of the different foods. I like to call our food honest food. It’s not over sauced, it’s not over spiced. You taste the food. You taste the components of the dish,” Anne Marie Ranni said. Ranni and his wife, Anne Marie Ranni, who also own Massimo’s Breads at 56 Stevens Road in Brewer, received approval for a liquor license for Massimo’s Pizza Bar from the Bangor City Council in April 2015. Massimo’s Breads, which opened in 2011, previously operated in the space for several years, before moving to a larger location in Brewer in 2015. Massimo’s Cucina Italiana, which opened in 2007, was the first of Massimo Ranni’s business ventures in Bangor after moving to the state from New Jersey, where he made breads, pizza and pastries at his bakery Il Forno in Montclair, New Jersey. 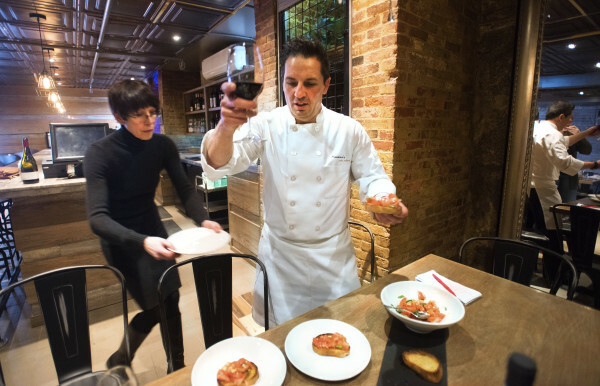 On Nov. 21, 2015, the Rannis celebrated the eighth anniversary of opening Massimo’s Cucina Italiana, but closed its doors permanently on Feb. 27. “You’ve got to do something new,” Anne Marie Ranni said. At Massimo’s Cucina Italiana, pizza was offered when the restaurant first opened, but after a few months, the Rannis took it off the menu. Massimo Ranni said that, at the time, the Bangor food scene wasn’t as vibrant as it is now and customers would request extensive changes to their orders, more used to the do-it-yourself kind of pie that American pizza places offer. In the past few years as new eateries offering artisan fare have popped up, the climate seemed right and the community seemed ready for a new artisanal venture. “I think that now is the time to try it,” Anne Marie Ranni said. The Rannis had originally planned on opening the new venture in late January or early February, but Massimo Ranni wanted everything to be perfect — not just the food, but also the space. The building where Massimo’s Pizza Bar is located, called the Clark House, is an old structure filled with intricate detail. Brick and stone are exposed and complemented by a design focused on oak and travertine accents in the dining room, which seats 40 people. “It’s Massimo’s 2.0. 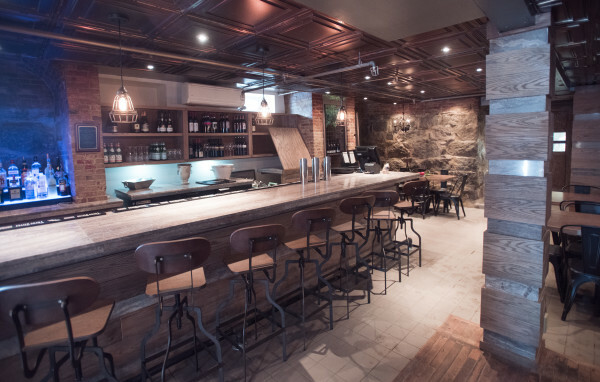 This is the new Massimo’s,” Massimo Ranni said. Massimo’s Pizza Bar will be open from 4 p.m. to 9:30 p.m. Monday through Thursday and 4:00 p.m. to 10 p.m. Friday and Saturday.